This is a little card and gift set I made for my nephew who is jetting off to America today. 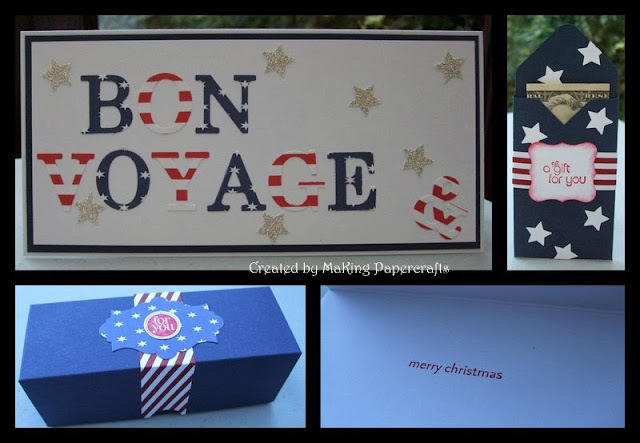 He's spending the next 6 weeks there and celebrating Christmas and New Year with friends - hence the 'BON VOYAGE & merry christmas'. I won't go into details about the products used as some are current, some are retired and some are computer generated but you get the idea. The box holds some of his favourite chocolate and the money wallet (made with the Envelope Punch Board) holds some US Dollars.